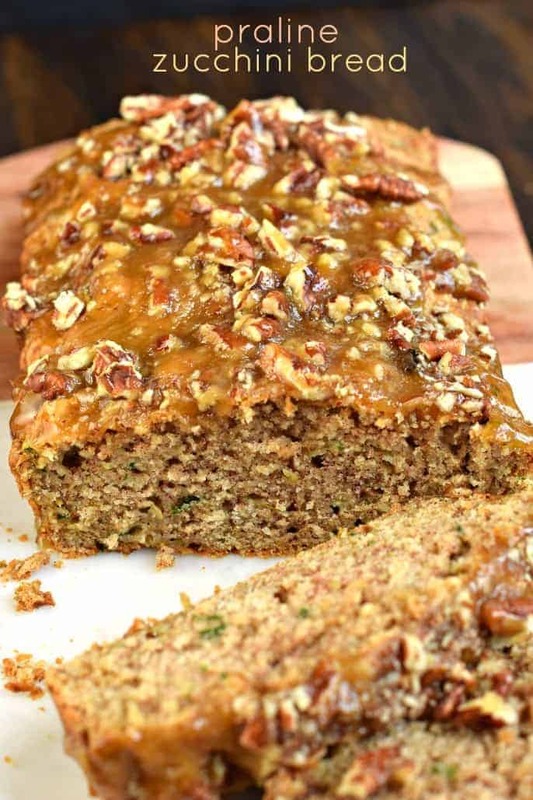 You’ll love this Praline Topped Zucchini Bread with it’s sweet, brown sugar topping. Sweet and salty, this bread makes TWO freezer friendly loaves! Perfect for sharing or saving for later! So we’re nearing the end of zucchini season, but that doesn’t mean my recipe sharing will end! 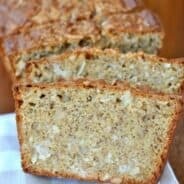 Growing up, we really only ever ate Mom’s Zucchini Bread. To this day it’s still one of my favorite recipes, but with the amount of zucchini I get out of my garden, it’s nice to have a variety of flavors! Right now I have at least a dozen loaves of zucchini bread frozen…from Lemon Zucchini Bread, to Crunchy Streusel Topped Zucchini Bread…and everything else in between! I love recipes that create TWO loaves, so that we can enjoy one, while freezing the other loaf for later this winter. They are also great to give away to friends and family! 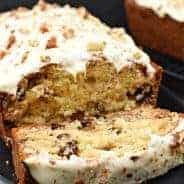 Last winter I made this Praline Topped Apple Bread and it was one of the most perfect bites of bread I’ve ever eaten. 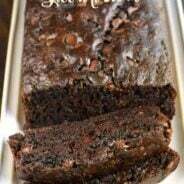 From the sweet cinnamon apple bread to the brown sugar praline topping, it had everything you could ask for. Crunchy. Sweet. Salty from the pecans. YES YES and YES. 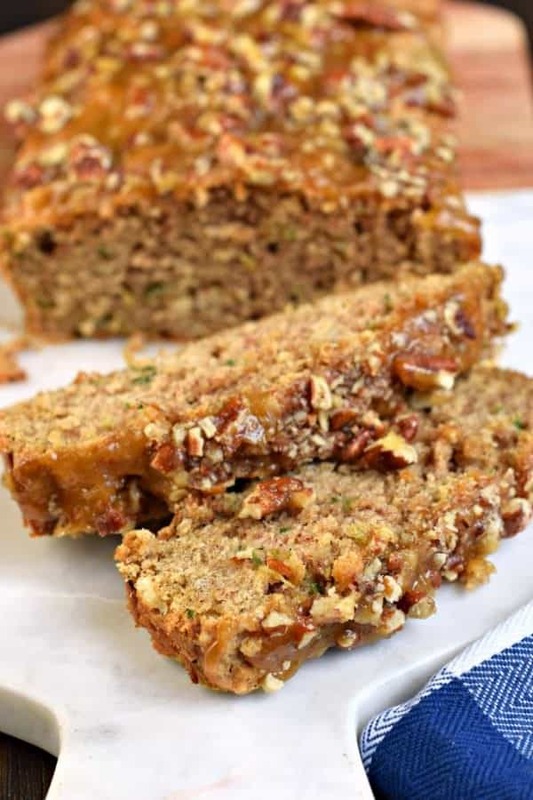 So, I took one of the zucchini bread recipes and decided to top it with that praline topping. What a lovely match, made in heaven. 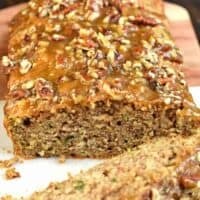 The zucchini bread isn’t as sweet as some of my other versions, so topping it with the brown sugar praline and pecans made it so tasty! Unfortunately when I made this bread we enjoyed it so much that we ate BOTH loaves. Looks like I better make more soon! Don’t forget though, if you’re looking for a savory recipe for your zucchini, you HAVE to try these Zucchini Meatballs. Perfect with noodles and sauce or on a hoagie! 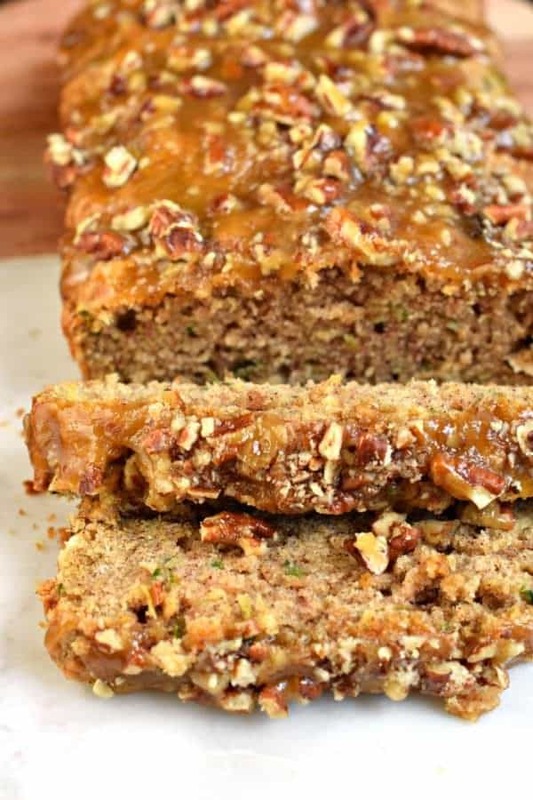 You'll love this Praline Topped Zucchini Bread with it's sweet, brown sugar topping. Sweet and salty, this bread makes TWO freezer friendly loaves! Perfect for sharing or saving for later! In a large bowl, beat eggs with oil, sugar, vanilla extract and almond extract. Add in flour, salt, baking soda, baking powder, and cinnamon. Mix until well blended. Fold in shredded zucchini. Pour batter into two loaf pans. Bake in oven for about 60 minutes. Remove and cool in pans ten minutes. Then remove from pan and cool completely on wire rack. While bread is cooling, make the praline topping. In a small saucepan, melt butter with brown sugar over medium high heat. Bring to a boil. Let boil for one full minute. Remove from heat. Pour hot sauce over bread, using about half of the sauce. Sprinkle with half of the pecans. Repeat. Allow topping to set, about 15-20 minutes. ENJOY. That praline topping. That is life right there! Yes it is 🙂 Thanks Averie! The world is a better place with zucchini recipes like this…keep ’em coming!